The quick and stress-free way to a beautifully decorated home this Christmas. Bringing you the perfect Christmas, this is your one-stop festive decorating kit. Contains everything that you need for that perfect Christmas experience. Get your home Christmas ready in an instant with the minimum of fuss and maximum results. The wreath and garland are sent complete with red berry decorations, sparkly pinecones and a festive bow, the real tree is potted, and ready to decorate (tree decorations are not supplied). It's impossible to beat that evocative pine-fresh fragrance that real fir trees bring to your home and our Christmas in a Box live decoration collection helps you acheive just that. Perfectly prepared, we've included three essential Christmas decorations to save you time and effort and yet still achieve an authentic Christmas feel in no time at all. Our fabulous Living Pot-Grown Christmas Tree is a real winner. The Norway Spruce is the classic fir tree with a lovely pine room fragrance, plus it will not drop its needles as it's still alive! The advantage of this tree is that you can keep it from year to year too and save a lot of money over 5 or even 10 years - after Christmas, simply move it into your garden, still in its pot for the rest of the year, keeping it well watered. 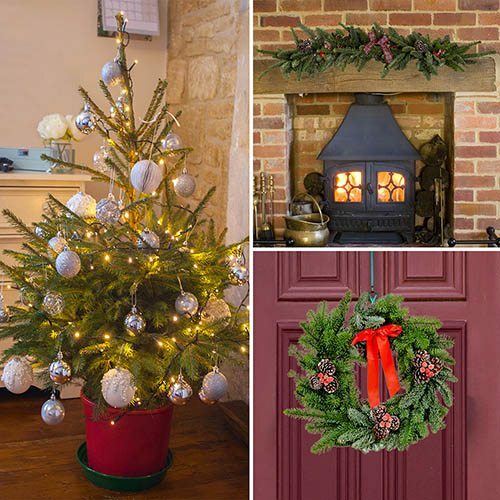 Decorate your home with style this Yuletide with our simply beautiful, fresh, festive decorations - nothing beats the sight of a real wreath or garland at Christmas! they're also ideal for laying along sideboards, on fireplaces, windowsills or even across tables as a beautiful centrepiece. Suplied as a 1-1.2m high real Norway Spruce (height including pot, decorations not supplied), plus a 1.1m long real fir garland (decorated) and a 30cm diameter real fir wreath (decorated).